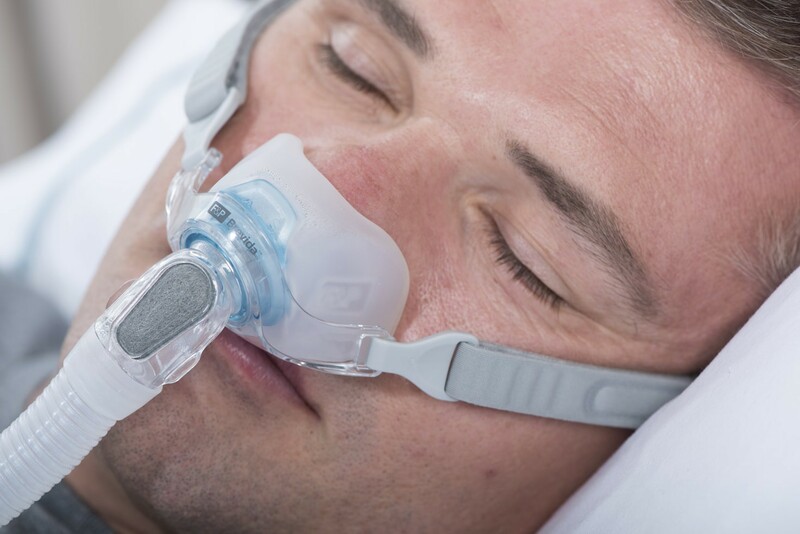 Fisher & Paykel's Brevida™ Nasal Pillow CPAP Mask with Headgear offers a minimalistic approach to the CPAP mask. The AirPillow™ seal extends from the tip of the nose to the cheek, resting just above the upper lip. Position the pillows inside the nostrils and allow the outer walls to stabilize the seal. Ships TODAY if you order within the next 8 hours and 54 minutes. Would You Like to Add Headgear to Make it a Complete Mask? 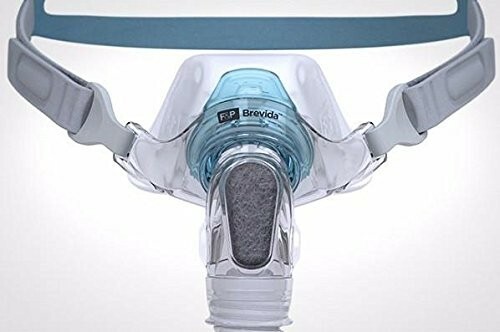 The Brevida™ Nasal Pillow CPAP Mask with Headgear from Fisher & Paykel is a lightweight nasal pillow mask designed for comfort and support. The AirPillow™ cushion inflates as air flows through the mask into the cushion and through the nasal passages. The soft walls extend past the nose into the base of the cheekbone to help secure the fit and prolong the seal. 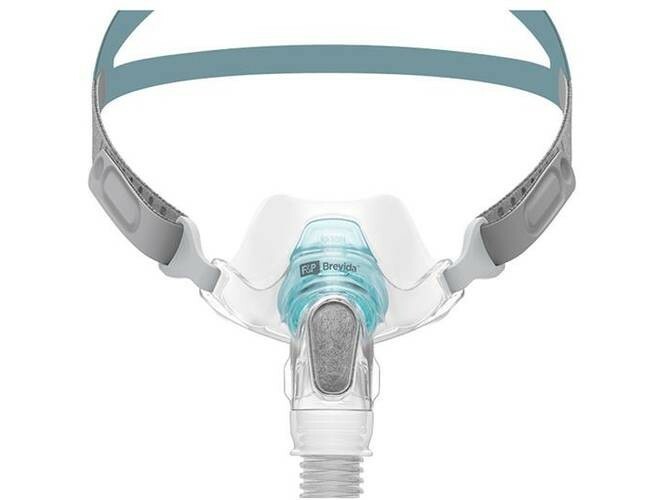 VisiBlue™ hues are found throughout the mask to indicate the various connection points on the mask. The AirPillow™ cushion is minimalistic and triangular in shape, extending from the tip of the nose to the upper lip. The unique geometric shape is designed to create a seal in and around the nose. This concept is unique as most nasal pillow mask seal inside the nostrils only. The cushion walls are thin, measuring 0.25mm, and they extend out slightly with the intent to create balance against the face and to create a stable seal. For increased stability during inhalation, F&P created an inflatable AirPillow™ nasal cushion, which moves the cushion closer to the nose during inhalation. As the user exhales, the material once again relaxes, allowing for ease of breath at each stage of CPAP therapy. The Brevida™ nasal pillow mask is designed to accommodate a wide range of facial structures. One cushion is intended to fit up to two sizes: X-Small - Small or Medium - Large, increasing the potential for an accurate fit with fewer attempts to purchase the correctly sized cushion. The blue hue found on the exterior of the Brevida™ adjustable headgear highlights the thin, dual strap headgear from the thicker beige headgear straps which connect to the headgear clips. The headgear slides over the head and above the ear, with both straps resting softly on the back of the head. The position and fit of the headgear are essential to obtaining a strong seal throughout the night. If the fit is not optimal once the headgear is placed over the head, the fit can be adjusted by increasing or decreasing the tension on the headgear strap as it slides through the headgear clip. VisiBlue™ is a unique Brevida™ design element designed to increase visibility of those connections points which are essential to the mask. The headgear, short tube, and swivel all display a blue rim or blue hue highlighting the points by which each piece attach. 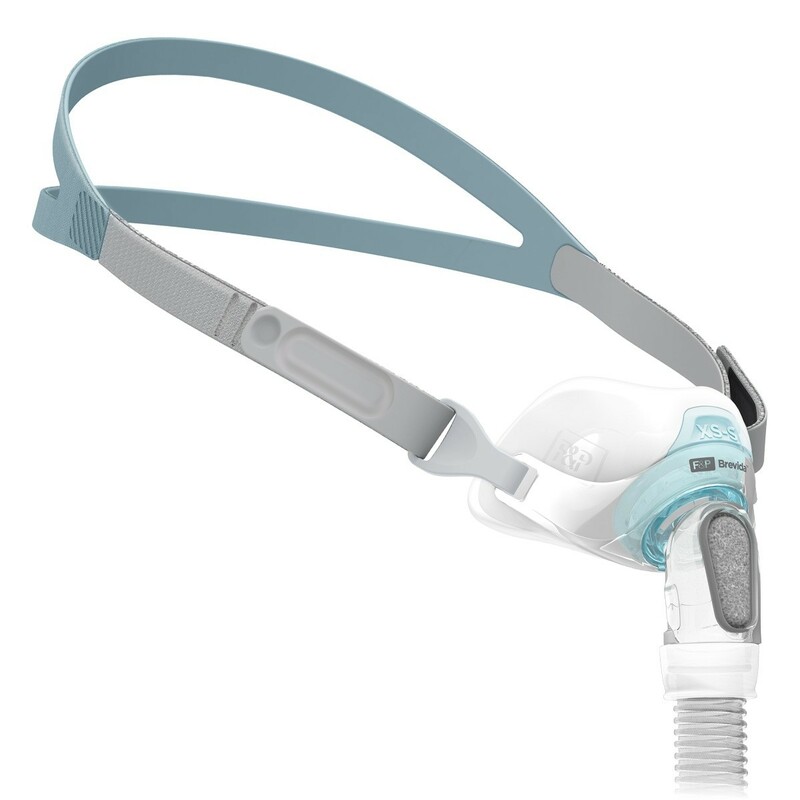 The short tube connects to the opening in the nasal pillow cushion and the blue rim of the swivel connects to the end of the short tube. 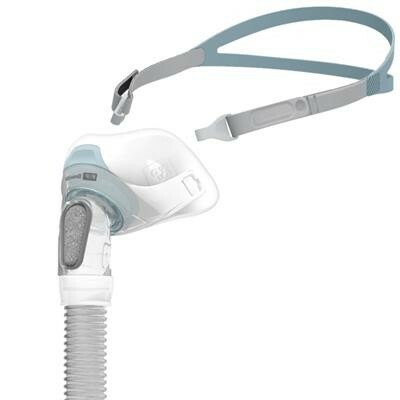 Together, these components attach to the CPAP hose whereby pressure is sent from the machine to the mask to the user. The short tube and swivel connect at the opening in the nasal pillow cushion, creating space between the mask and the CPAP hose. The additional foot of space allows the user more mobility throughout the night, creating a more gentle CPAP experience. The diffuser cap with filter sits between the mask frame and the short tube, diffusing the sound of the air as it is released from the mask and capturing fine particles. As the filter and cap combination become dirty, functionality may decrease, but the Brevida™ diffuser cap and filter are washable. Clean once a week to prolong the life of the equipment and maintain mask functionality.